A file photo of commerce and industry minister Anand Sharma. 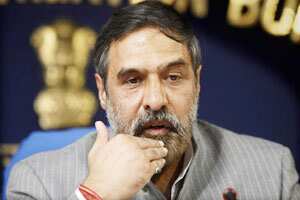 New Delhi: The government may have been forced to put FDI in multi-brand retail on hold, but commerce and industry minister Anand Sharma said the decision was taken out of conviction with full backing of the Congress Party. The interview was recorded before the announcement by Trinamool Congress chief and West Bengal chief minister Mamata Banerjee that the controversial decision on allowing 51% FDI in multi-brand retail has been put on hold till there is a political consensus. Sharma thought liberalizing the sector would send positive signals to global investors showing that India “has self-confidence". When asked whether the decision which was announced in the midst of Parliament session, had the backing of UPA chairperson Sonia Gandhi and Congress general secretary Rahul Gandhi, Sharma said the party was one on the issue. Quizzed by the interviewer Karan Thapar about silence of Sonia Gandhi and Rahul Gandhi on the issue, he said: “Where is the silence? You think the Congress spokespersons can articulate complete support without party endorsement. Congress spokespersons never speak without authorization of the party." He said opening of the retail sector to foreign investors was in the interest of the small farmers and industry and these segments are close to the Congress leadership. Asked about the dissension within the Congress, the minister said, “the party stands united" and there were only one or two voices of dissent and the issues raised by them were being addressed. Sharma did not agree that the government was being over ambitious in opening 53 cities for global retailers in one go. He said the Centre’s policy provided only an enabling framework and it was up to the state government’s to “accept, change it, tweak it". He said according to a government estimate, the sector provided 10 million job potential within three years. The minister said that contrary to a perception that there was a policy paralyzis, the government took two major decisions - New Manufacturing Policy and FDI in retail.